A question? Get instant answers for the most common questions! Topic'it is a free application for online forums- helping you and your members to follow and share their passions and hobbies. Administrators can register their forum in a minute. Their members enjoy a friendly navigation from their mobile! Topic'it is the best way to browse your forums easily from your mobile. Administrators can register their forum for free. Their members enjoy a user-friendly mobile navigation. Topic'it is 100% free for users and for forums owners ! Does Topic'it support my language? Topic'it supports French, German, English, Arabic, Spanish, Italian, Portuguese, Russian, Greek and Romanian. You can change your language at any time. Which OS are compatible with Topic'it? The minimum requirements are iOS8 version for Apple devices and the 4.4 version for Android. Is Topic'it optimized for tablets? Topic'it allows you to access your forum from both smartphone and tablet devices. You can also connect your Topic'it account from several devices at the same time. Is Topic'it compatible with HD displays? You can reset your password at anytime either from Topic'it app or from our website. If you forgot your password, go to the connection page or the app and click on "I forgot my password". You will receive an email with all explanations to reset your password. Why should I validate my email address? When you create your account on the website or the app, you will receive an email to validate your email address. If your email is not verified, the Topic'it services won't be available. You can get a new validation email by trying to log in on the website. How to modify my email address? Topic'it members can modify their email address from the website or from the app. A validation of the new email address is required to confirm the replacement. Your Topic'it password does not change. How to delete your Topic'it account? Access your member area by clicking on this link. Then click on "My profile" and then on "Delete my account". Finally, click on the "Delete my account" button and confirm. Your information will be lost (subscriptions, notifications...). Warning: a Topic'it account and a forum account are different and independent. To delete an account created on a forum, you must follow the instructions proposed by this forum. Can I connect on Topic'it with an existing forum account? All accounts created on your forum can be used to login into your forums via Topic'it app. Existing accounts are identical on both the internet version and on the app. Conversely, you can login into forums on the net by using your Topic'it accounts ! Is the content published from Topic'it visible on Internet? 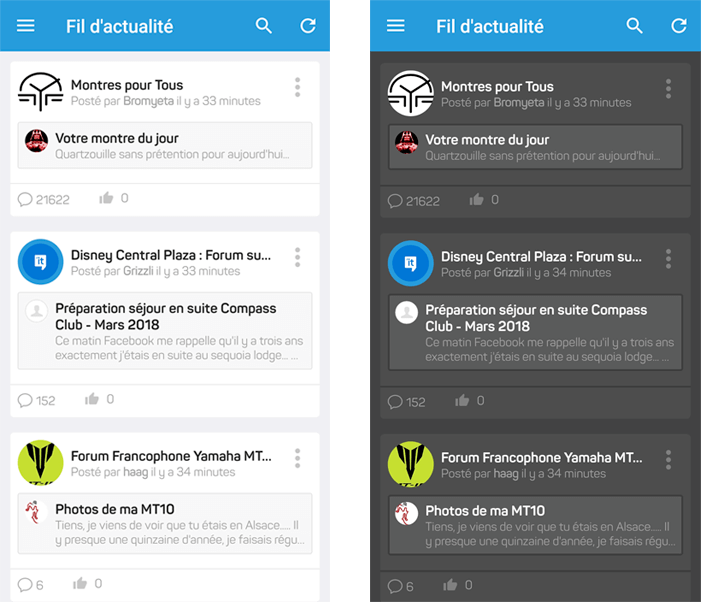 All contents you publish on your forum from the app is immediately visible on the net. And vice versa ! Moreover, Topic'it respects forum permissions. If the content is written on a private section, only members with the permissions accesses can see the content. Can I send private messages from Topic'it? Can I follow all my favorite forums? Of course ! Topic'it allows you to follow all your favorite forums from one single application. Forums just have to be compatible with Topic'it. If this is not the case, you just have ask to the forum owner to install Topic'it plugin ! Can I receive notifications from my favorite forums? You can received real-time notifications for all your forums news: new topic, new reply, new private message... You receive notifications directly on your mobile. Of course, You can choose to be notified or not. All is configurable! How to search for a forum by URL? To quickly find a forum on the Topic'it app, it is possible to do a search using its Internet address (URL). To do this, you must access the directory, click on the search icon and fill in the address of the forum. Be careful, it's important to enter the exact address of the forum: start with http or https, with or without www... Once the complete address is filled in, the forum should appear. Warning: the search for a forum is available on the views "Discover", "Directory" and "Quick Access" (on Android). The search on the view "Newsfeed" does not allow to search for a forum, only a topic present in this feed. How to find a forum in the directory or via the keyword research? On the Topic'it Directory, you can find a forum by browsing categories or by searching by keywords. Warning: only forums in the same language as your Topic'it account are visible. So you can easily discover forums related to your interests and in your language. If you don't find a specific forum, or in another language, it's advisable to search for a forum by URL. How to enable Night Mode on Topic'it? You can choose the main colors of the Topic'it App via an option to activate manually. Indeed, you have the choice between a light mode (the theme by default) and a dark mode. Dark mode is simply a Night mode that displays darker colors. It’s a much darker version of the mobile app that’s a lot easier on your eyes, especially if you’re browsing at night. Click on the icon at the top left of the app to open the Topic'it menu. Once the menu is open, click on the avatar of your account and then on "Settings". You then have access to various options including "Enable Night Mode". You then have access to various options including "Default screen when opening Topic'it". Go to a forum in Topic'it. If you are not connected to this forum, you should see a navigation bar at the bottom of the screen with a "Shortcut" icon. Click on it. A message appears telling you that the shortcut is being created. By accessing the Android home screen, you should see a new shortcut consisting of the logo and forum title. You can position this shortcut where you want by pressing and holding it and dragging it. Warning: on Android 8 and greater, the shortcuts become the Pinned Shortcuts and their process changes. You must press and hold the Topic'it icon on the Home screen to see the shortcuts (learn more). How to receive push notifications? Subscribe forum via "Start watching forum" feature (available on the web-side only): you will then receive push notifications regarding new topics created in the forums or sub-forums you are subscribed to. Subscribe topic via "Watch this topic for replies" feature (available on the app or web side): you will then receive push notifications regarding new replies posted in the topics you are subscribed to. On the web-side forum, you must be sure to accept email notifications in your member account settings. Push notifications are linked to e-mail notifications. How long does it take to be added to Topic'it directory? Once registered, your forum will immediately appear on the Topic'it directory. Then, you can choose the closest category of your forum theme. Thus, all Topic'it users will easily find your forum. Can I register a private forum? You can register a private forum on Topic'it. The app permissions respect your forum permissions. For your forum to be 100 % private, you just need to deactivate new registrations and change the settings not to appear in Topic'it directory. How to remove ads on Topic'it? For the moment, you cannot remove ads on Topic'it. In a future release, you will be able to browse the App without any ad. Moreover, Topic'it is committed to display only acceptable ads without any redirection. How to embed a YouTube video in a phpBB 3.1 or 3.2 forum? If you have a phpBB 3.1 or 3.2 forum and you didn't customize the BBCode balises, the YouTube videos sent from the Topic'it app might not work. Indeed, Topic'it displays YouTube videos from the BBCode [Youtube] that is not on the phpBB forums. In your administration panel, go in "Messages" then "BBCodes"
Check the case "Display on the page of a message" then click on "Send"
Why install Topic'it on my forum? Topic'it allows owners of a Forumotion or phpBB forum to make it available on an Android and iOS mobile app. Unlike a mobile version or a responsive website, an app offers many advantages: easy access to the forum, stay connected to the forum, receive notifications in real time... Your forum also benefits from the Topic'it community (150,000+ forumers). Topic'it is particularly recommended for members on mobile accessing several times a day to your forum. In summary, it is simply an additional solution to access your forum. Some members will prefer to visit your forum on Topic'it, others will prefer to continue on their web browser. In the end, Topic'it offers a solution to increase the engagement of some members and to have a more active forum. A Deep Link is a simple clickable link that allows mobile users who have installed Topic'it to directly access your forum in the App. On this way, it's extremely easy to invite new members to visit your mobile app forum for instance. For Forumotion forums, a Deep Link to your forum is available in the administration panel (Topic'it tab) or in the menu of the mobile version ("App Version" link). This Deep Link will be available soon for phpBB3 forums (don't hesitate to contact the support to get it). How to monetize my forum? As the owner of an external forum (not hosted on Forumotion), you have the possibility to monetize your mobile audience and generate advertising revenues on Topic'it. For that, you must create an account on the MoPub ad network. You will then need to configure it to get and insert your own ad tags in your Topic'it user area. The rate of Revenue Sharing, between you and Topic'it, can change over time. Nevertheless, you have the certainty of earning at least 70% of the advertising revenue generated by your forum. Can I use my own Analytics code for Apps? Is the App Indexing available on Topic'it? Could Topic'it improve search engine ranking? Activate the App Indexing feature, after registering its forum on Topic'it, can improve your mobile search engine ranking (SEO) in case your forum is not mobile friendly (Mobile-Friendly Test) or your web pages loading time is really slow on mobile devices. With the App Indexing, Google will consider your forum as 100% mobile-friendly and give a ranking boost to your forum pages. Moreover, Google announced they will show more content from indexed apps in their search results pages: finding more mobile-friendly search results. Finally with mobile-first indexing, it means that we'll use the mobile version of the content for indexing and ranking. Which forums are compatible with Topic'it? How do I add my forum on Topic'it? To add your forum on Topic'it, you just have to install Topic'it plugin (See plugins) then create an account and connect to the website. The link "Register a forum" will be immediately available. If you need help, you can contact our technical support. How do I install the Topic'it plugin? For all Forumotion forums, no installation is required. For the other forums software, there are two options: 1. Install the Topic'it plugin (no technical skills needed. Follow our installation guide) 2- Create your own plugin thanks to the Topic'it API, the documentation, and our technicians help. Can I register several forums with the same account? All administrators can register several forums through one single account. You can add an unlimited number of forums via Topic'it website. Then, all your forums will be directly added to your Topic'it profile.